Driving four RGB LED packages from an ATtiny85. Each LED can be set to one of 16 different levels, from off to full brightness, and the circuit leaves one I/O pin free for another application. 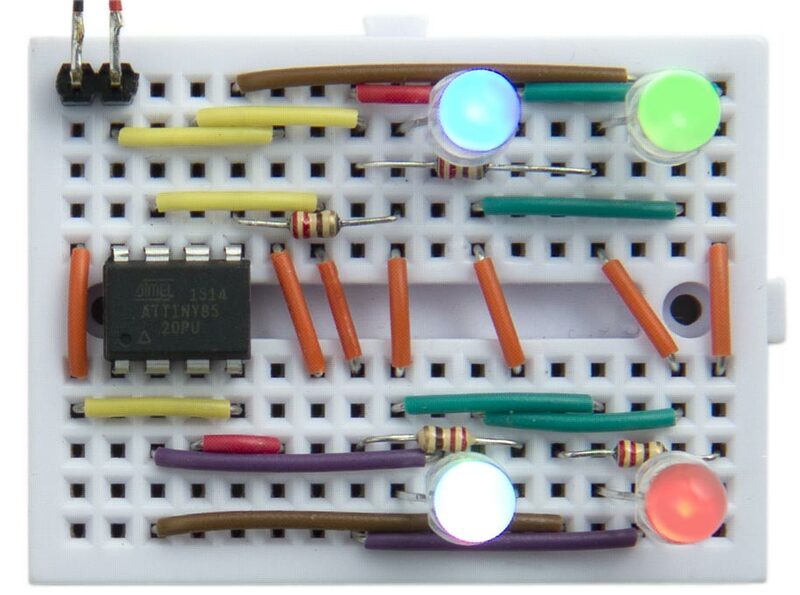 Circuit for driving four RGB LED packages from an ATtiny85. It's compatible with common-cathode RGB LED packages; I used low-cost four-lead common-cathode 5mm RGB LEDs , but you should be able to use any sort of RGB LEDs. The LEDs are updated in the background, from the values in Buffer, using interrupts generated by Timer/Counter1, leaving Timer/Counter0 free for use by delay() and millis(). sets the four LEDs to 100% green, 100% blue, 100% red, and 50% white respectively. The interrupt occurs at a rate of 5kHz, so a complete set of 64 cycles of DisplayNextRow() occurs at approximately 78Hz, fast enough to avoid flicker. Compile the program using the ATTiny Core, which supports all the ATtiny processors and supersedes the various earlier ATtiny cores . Choose the ATtiny25/45/85 option under the ATtinyCore heading on the Board menu. Then choose Timer 1 Clock: CPU, B.O.D. Disabled, ATtiny85, 8 MHz (internal) from the subsequent menus. Choose Burn Bootloader to set the fuses appropriately. Then upload the program to the ATtiny85. Here's the whole Four RGB LED program: Four RGB LED Program. ^ Kingbright RGB Through Hole 5mm LEDs on Farnell.